Prasid Mini My Pad English Learner enables your child to learn and also have fun while learning numbers, alphabets, words and mathematical operations. 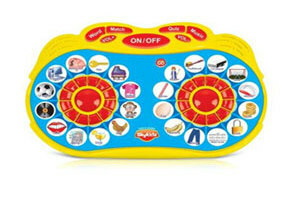 It is a smart way to keep your kid busy learning spellings and solving quiz or mathematical operations. Prasid brings this amazing mini my pad that makes the learning process interesting. Mini my pad english computer features: mini tablet my pad size – l x w in inches, 8 x 5. 5, functions: 1-10 are 10 number keys and music keys, a- z letters and word keys, number song, alphabet song, letter mode, word mode, spell mode, demo, repeat, quiz word, quiz spell, quiz maths, on/off, volume up/down, auto turn off after few minutes if not used. Packed in individual colour box. Note: battery not included.